Creating a customized wood jigsaw puzzle is a collaborative process. Many people have used them for gifts, entertainment, stocking stuffers, wedding presents, and one of a kind gifts. When we make each puzzle we take into account who is receiving the puzzle and who is giving the gift. The persons interests are that is receiving the puzzle and what the occasion is. Its personal. 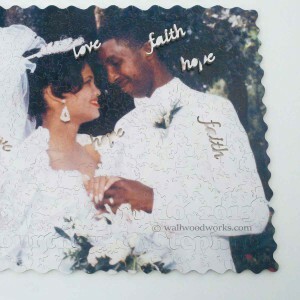 The most unique aspect that we have found with making a custom wood puzzle is clients get to tell a story within the puzzle and make a memory. If I remember correctly the story depicted in the above puzzle is about a family. At some point this family; husband, wife, daughter, and pup; decided to take a vacation. They way things worked out is unfortunately the fun-loving pup was not able to go on vacation with them. 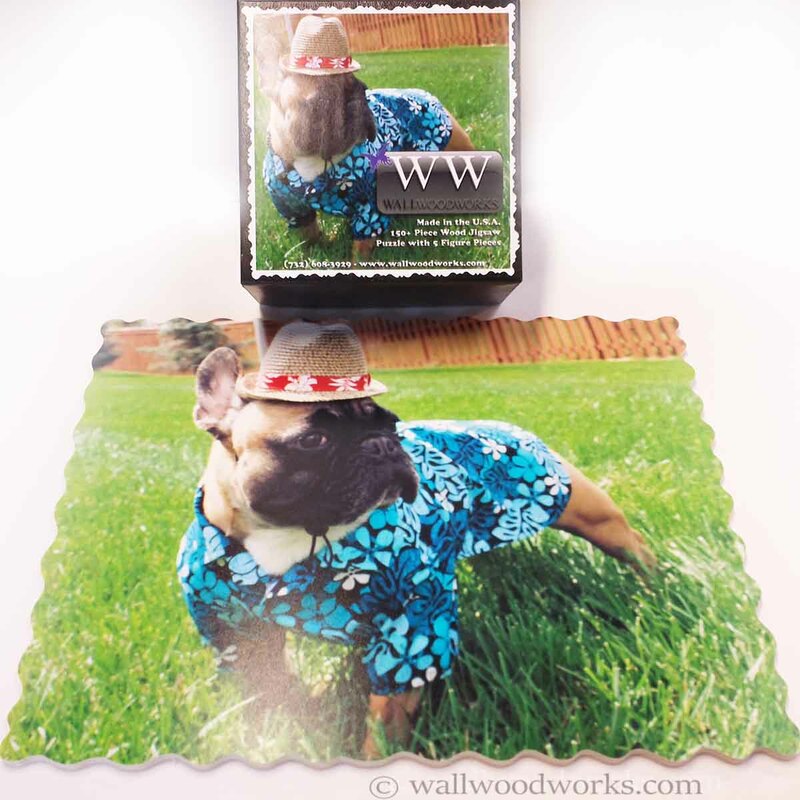 They contacted us and we made custom wood puzzle from the image of the stout little pup on the grass. They shared their story and we got right to work. We were able to shape one of the figure pieces exactly like the pus. So while the family was on vacation they were able to assemble the puzzle and even though a part of their family wasn’t present they still had him there in spirit. What are Figure Pieces or “Silhouette” pieces? A figure piece is a specialty carved out piece within a custom wood puzzle that can be shaped like anything! 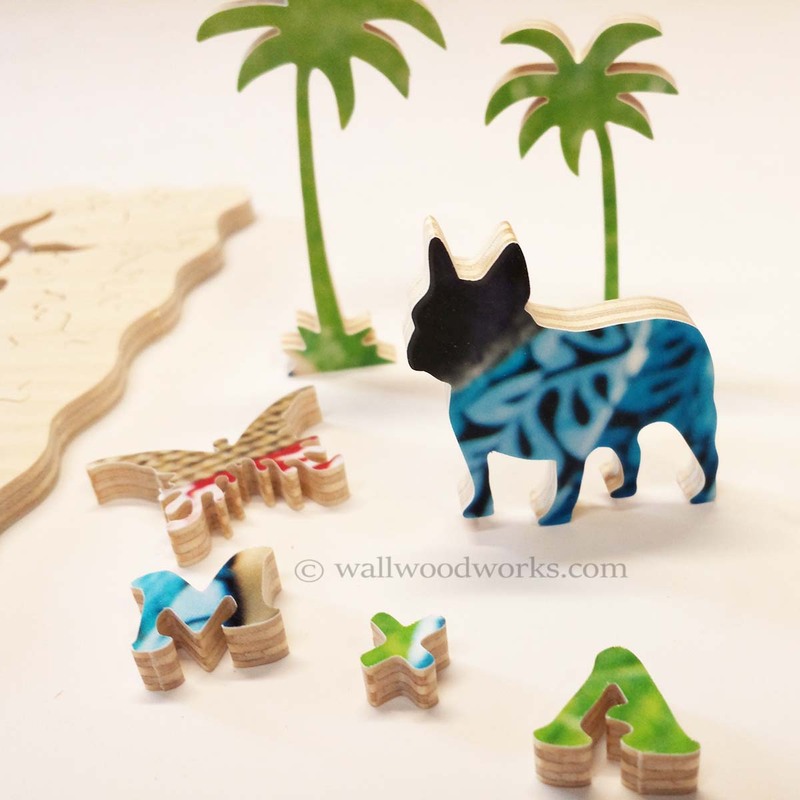 The wood jigsaw puzzle piece could be a cat, a dog, the logo for your company, a date that you met your spouse, a favorite hobby, a pastime, the name of a pet, the names of your kids, initials, sports that you like…the possibilities are endless! This is really the fun part. 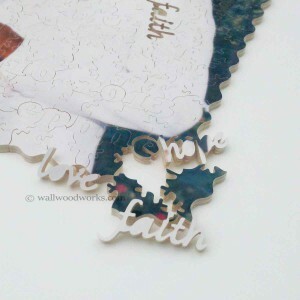 When you purchase a custom wood puzzle as a gift for someone or even for yourself I ask that you tell me about yourself a little bit in the Order Notes at checkout. A short few paragraphs will assist me in designing your silhouettes and figure pieces. I then cut those pieces into your puzzle! Ok Great! So what size is this custom wood puzzle? What is Style & Cut? Style refers to the edge and corner style of the outside of the puzzle. The choices are strait edges with square corners, strait edges with round corners, and scalloped (…as shown in the images above…) The cut refers to the types of connectors we cut when making the puzzle. Classic round knob or ear-let which is shaped like a heart. Our puzzle packaging comes in two different variants. One variant is with the image printed on the label that the wood jigsaw puzzle was made from. The second variant is with a label that has no image at all and the assembler has no idea what they are getting! 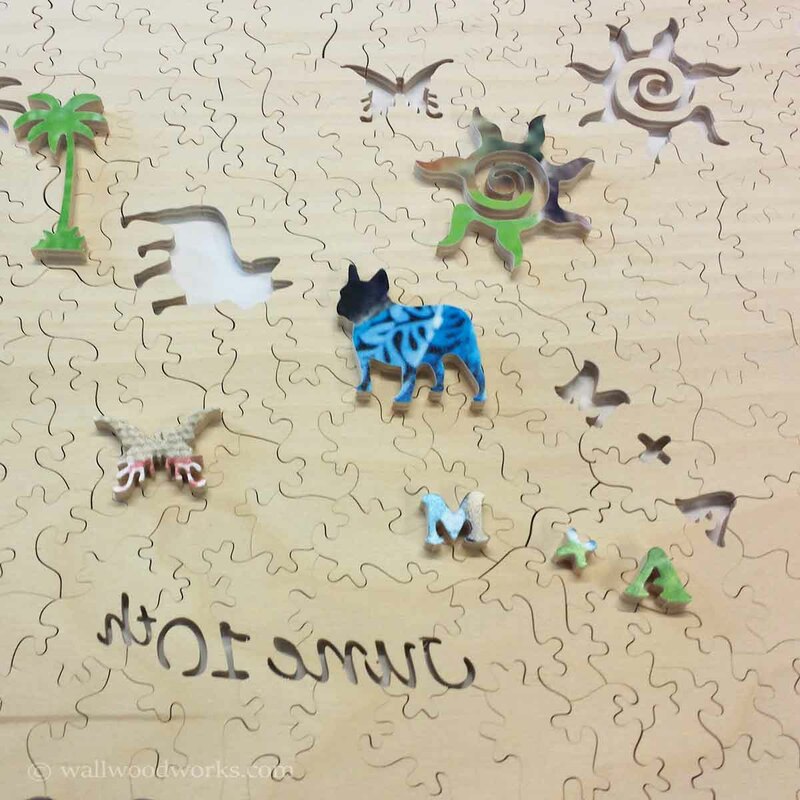 It is really up to you as the buyer to decide what kind of packaging label would like & how much you want to drive the person crazy receiving the wood jigsaw puzzle gift! Sure no problem! Specify at checkout that this is gift for a family member or friend within the “Order Notes” Then click on the “Ship to Different Address” box right below that. Then enter your recipients information. Very easily. Once you choose your piece count go ahead and place your order. 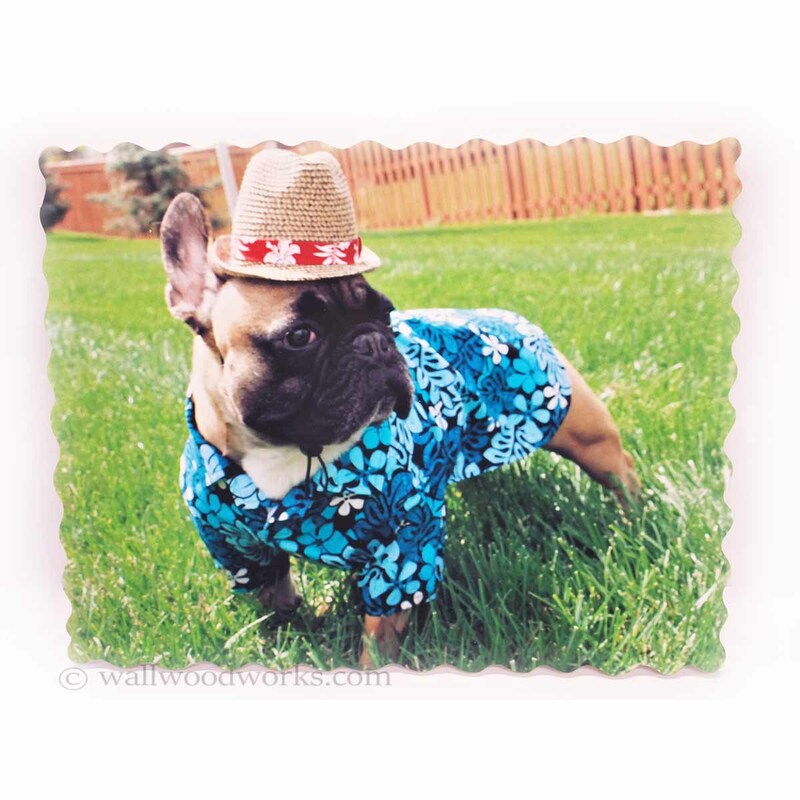 Once your order is placed within the “My Orders” section on this website you will be given the option to upload your image. Then your done!